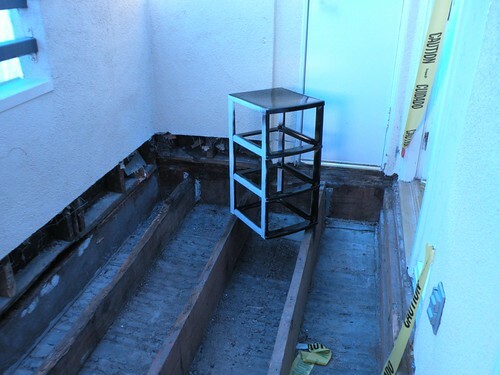 As most of you know, I’m stuck in this apartment in LA until the end of June. After that I’ll go back home! Yay! Sooo anyway, I’m trying to ‘make do with what I got’ while I’m in SoCal soaking up the sun. I have this really plain boring temporary Sterilite drawer thing that I found at Target next to my TV. 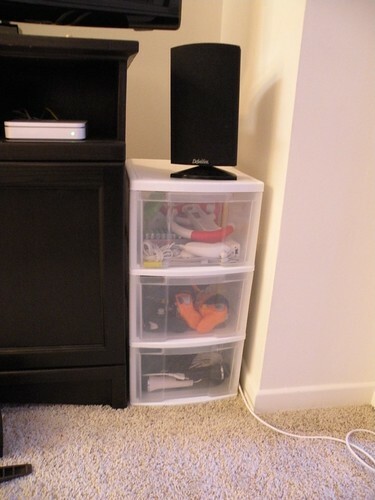 We weren’t going to buy anything but we had no where to store all our Wii controllers and entertainment junk, so we found the cheapest most practical thing we could find. It fits perfectly but it really stands out like a sore thumb! So I decided to try my hand at spray painting plastic. I went to the store and got black spray paint FOR PLASTIC (remember to get the paint for plastic or you will be very sorry!) and started painting. Sigh. Yes, my deck still looks like that.Grrr. Grrr. Grrr. I’ve decided to take my deck lemons and make lemonade by just painting on the deck anyway. I’d hate to have another paint drama like last week! Painting this thing was so easy! It took me like 10 minutes and then another hour or so to dry and I was done. It totally blends in now! 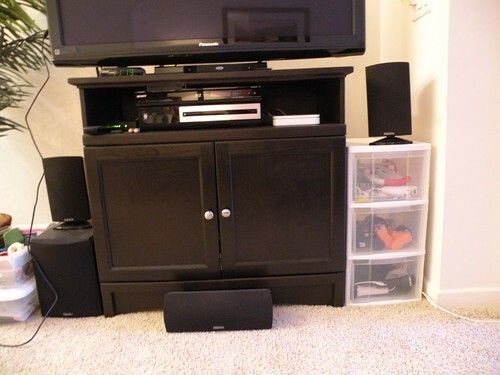 This entire entertainment system we have going on here needs to just be shot (do you love my front speaker just sitting on the floor in front of the cabinet? ), but it’s what I have for now so I’m makin’ do! I’d prefer to NOT have so much junk piled up, and I’d also prefer to have an entire entertainment center so I can decorate it and make it all purdy. I really am grateful for this amazing opportunity I’ve been given to live in SoCal for 6 months. I’d never been to Cali before now and am really enjoying my time here. Yes, I have to make do with all sorts of less-than-tasteful decorating solutions, but at least I’m here, my family’s here, and we are making ah-mazing memories. It blends in nicely now! I love plastic paint. I had a 3-drawer chest like that one (only it was pink) and spray painted it red. It fits perfectly under my kitchen table and holds some of my kitchen toys and other ‘stuff’ I don’t use every day. What would we do without spray paint, LOL? Making do is what it is all about these days. Amazing how a little paint can completely transform a piece. Thanks fro sharing. That looks good! Great idea. Come stop by my Favorite Things Friday Party if you would like to join in! I’m super impressed with your plastic painting skills and your happy heart! Well, that was very clever and frugal of you. Great thinking…looks awesome! Wow, the plastic storage drawers look so much better painted. I never would have thought of that. Love your creativity. I use storage drawers in my classroom for supplies and I dislike the fact that my junk can be seen through the drawers. Your use of spray paint makes me wonder if the drawers would look better if they were painted also. Thanks for the inspiration. 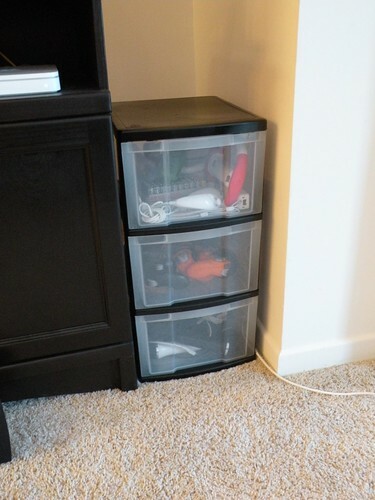 I have seen these where people have put fabric or scrapbook paper in the front of the drawer to hide the stuff inside. I don’t know if that bothers you, but it could be really cute. Enjoy your time in SoCal! I am a 3rd generation native and don’t think I could live anywhere else. I want to play in SoCal for 6 months!!!! Such a great idea!!! I love your tv hutch too!! Thanks for linking!! What a GREAT idea! I have several of these ugly white things. It looks so much better black. Oh, much better! That came out great! Following from Friday Follows, come follow me back and enter to win a pair of Fresh Water Pearls. Great way to make it work! I love that we can now paint plastics.. that is a great way to make do with such… your decorating is grand.. don’t worry cause your not there for the long run.. make do! I have the same drawer unit to file my financial stuff. I modpodged some scrapbook paper to the front of a hanging folder and hung it in the front of the drawer: clutter concealed! Super Duper! I love paint. It can make anything look good. You should Modge Podge some black Velum to to the front/inside of each drawer where you can still see through them but make them darker too. I am so curious why you are in Ca for 6 months? It looks a lot better, I love paint! You did such a great job, it looks so much better! P.S. Most of us have been where you are and it makes you appreciate “home” a lot more! I’ve got two of these in my laundry room. I saw some apple green spray paint yesterday that would do the job and match the room. Thanks!! It does look better! Nice job. Much better! I wouldn’t have thought to paint the plastic! Have you thought about putting cute or decorative labels on the front of each drawer? @Gina I’ve considered it. I tend to think and think… and think about projects and exactly how I’d like them before I do anything, so I’m still trying to figure out exactly what type of labels I’d like. Not exactly sure what direction I want to go with it. I’m really into vinyl at the moment… Hmmm that’s a good idea… off I brainstorm! Spray paint rocks! You’re right. It blends now. Gonna snoop around your blog now. 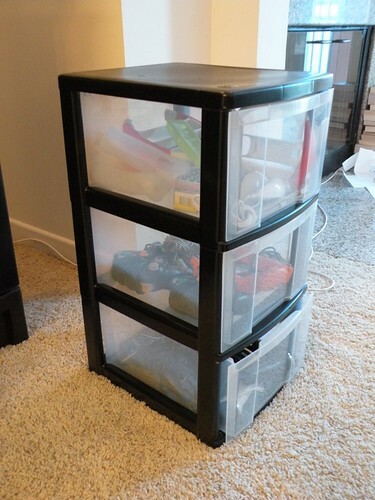 I have that exact storage unit and I’ve always felt is was yucky to have this big plastic chunk is our living room….but it stores all my Munchkins plastic animals….which means I’m not stepping on them all the time. That is good. 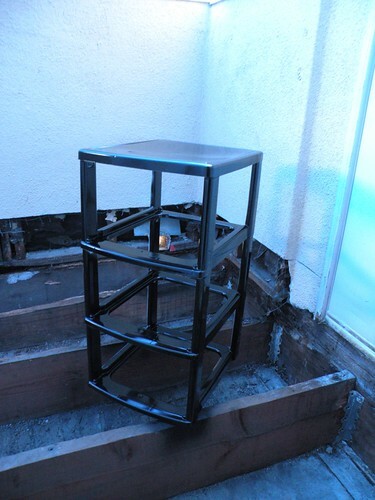 Now, thanks to your idea….I can make it fit into our house a little better. Thanks for the project!!!! Got my apple green paint over the weekend and so I’ll be painting mine sometime this week. Spray paint is my friend too. Great make-over. That turned out great. I haven’t tried spray painting plastic yet. But it turned out fabulous for you. Thanks for the inspiration. Thanks for sharing at Fun to Craft’s Spring has Sprung Party. what a cute idea, I have several of those and never thought about painting one. One thing I did with mine was to glue pretty scrapbooking paper on the inside of the drawer for the front panel(so the pretty side is seen from the front,it helps hide what is in the drawers too. 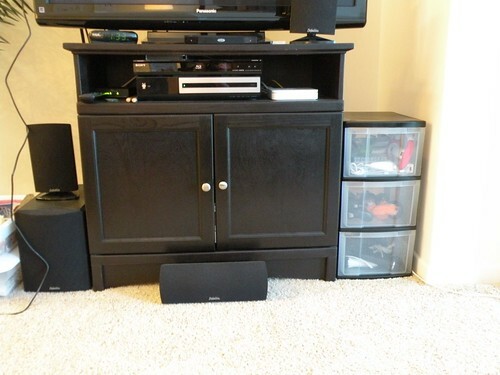 Oh my gosh…I can’t believe what a difference the paint made! I have several of these stands in my classroom at school and they are no longer white…dirty and nasty. Now I know how to fix them without having to replace them. I am starting to think I may have to start calling spray paint my new bff!